Many parts fitted to the DB MkIII are the same as the DB2 to MkII, please check here if the part you require is not listed in the MkIII section. The Aston Martin DB2s (or DBII's) were built from May 1950 to April 1953, with Chassis No's LML/49/1 to LML/50/406 & LML/50/X1 to /X5, these cars were originally fitted with a 2580cc engine, although many were fitted with 3 ltr engines by the Service Dept.  Aston Martin DB2/4s were built from October 1953 to October 1955, with Chassis No's LML/501 to LML/1065, these cars were originally fitted with a 2580cc engine, a 2922cc was introduced in April 1954, many early MkI's were fitted with 3 ltr engines by the Service Dept. Aston Martin DB2/4 MkIIs were built from October 1955 to August 1957, with Chassis No's AM300/1101 to AM300/1299, all of these cars had a 2922cc engine.